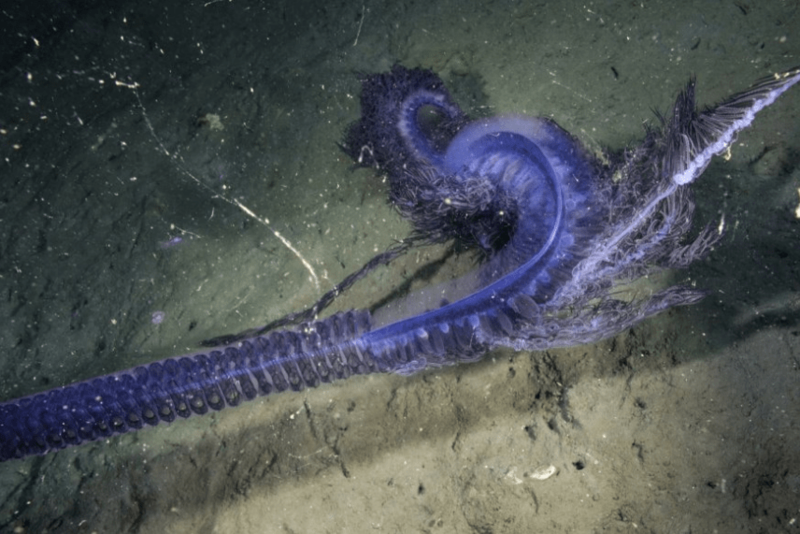 This strange animal is a siphonophore, a relative of jellyfish. The most famous (infamous?) siphonophore is the portuguese man-of-war, but there are many species that live in the deep and are only seen on rare occasions. What’s amazing to me about about this animal is not just its strange shape, but its color. I’ve seen red siphonophores like this, a couple orange, but never ever this strange purple-blue. It’s a shocking shade, and it makes me wonder what on earth a color like that is doing down so deep. Many deep-sea animals are red. Because there is no red light in the deep sea, very few animals can see red pigment (unless they make their own red light). In the deep sea, red looks like pitch black. But what about purple? Is there any benefit to being purple? Or is this just a side effect of something it eats or where it lives? Answering these questions is difficult, because sightings of siphonophores like this one are pretty rare. These animals are only found in the very deep ocean, and though large, they’re still small compared to the miles of water a submersible had to travel in order to find one. What’s worse, they often drift alone, not traveling in groups. This makes tracking down an animal like this more about luck than planning. That being said, some expeditions are very lucky. So maybe we’ll get the answer one day. Until then, I’m happy to sit back and enjoy the beautiful show.